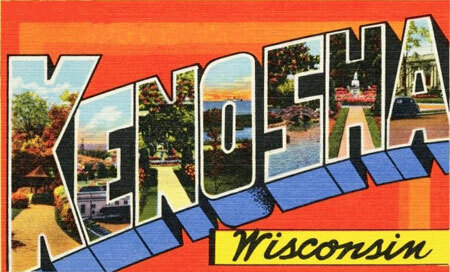 I have very fond feelings for Wisconsin as not only did I attend four stupendous years of college in Madison, but I returned there last September for my conducting debut. 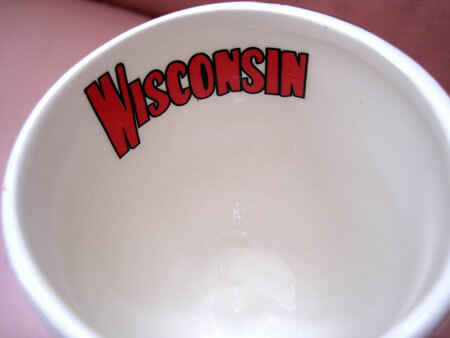 If I had an inch to spare in my suitcase, always packed as if a natural disaster could hit at any moment and I could sustain myself for weeks despite the fact that I may only be gone for three days, I might have brought my Wisconsin cup. 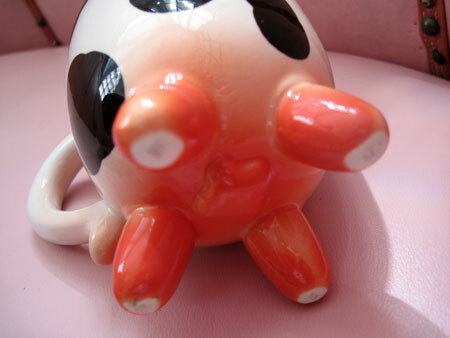 But this is a brat and beer state and udders don’t exactly spew the latter. 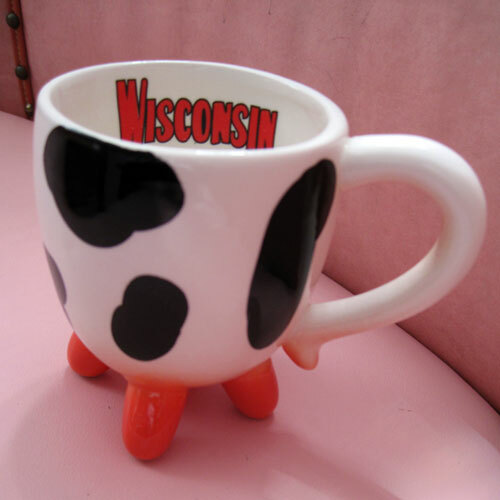 Besides, the coffee at the Best Western, THE hotel in town, has been lukewarm every time I’ve tried it, so it’s not worthy of swimming on top of the milking spouts. 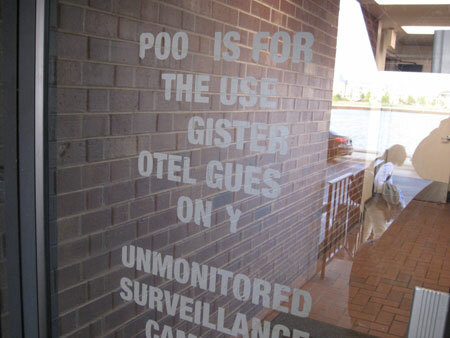 But speaking of swimming, the coffee machine is located in the lobby and that overlooks the pool, or should I say poo. We had some time to kill on Tues, April 5th, before going to a reception for the Rust Belt To Arts Belt conference I was giving a speech at the next day. 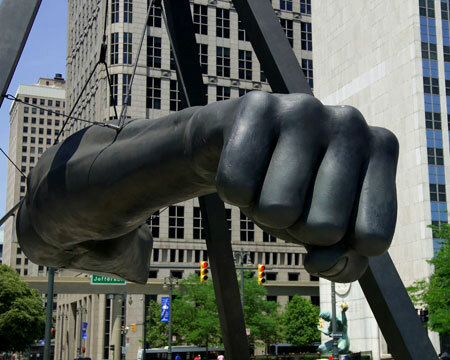 The party was downtown so we used the opportunity to swing by Detroit’s most famous landmark, The Spirit of Detroit. 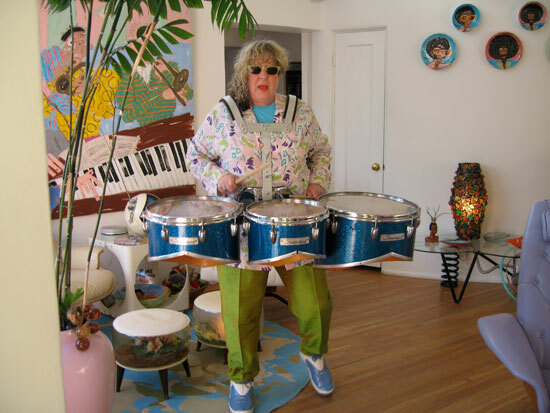 My friend and hysterical TV comedy writer, Maxine Lapiduss, has done a brill job on the just-released-and-going-exceptionally-strong video for a song I co-wrote with her, Mark Waldrop, with whom Maxx started the lyric, and Michael Orland, musical director and accompanist for American Idol, good friend, and neighbor of mine who came over with Maxx and with whom we banged out the music in a few hours. In the lexicon of kitsch, ‘cheese’ and ‘cheesy’ are words often used to describe objects that grace the highest echelon of kitsch itself. As if there wasn’t enough cheese to go around on Super Bowl Sunday between the dedicated–to–the-point–of-Camembert headgear and face paint that loyal fans wear to the game, the obscene price of tickets, the even more obscene money dumped into commercials, the melted cheese on the pizza and hot dogs… it’s a veritable wheel of Brie when throngs gather around the TV screen or freeze in the stadium to watch people ram into each other insuring that life after 50 will be spent in the maximum amount of pain possible. 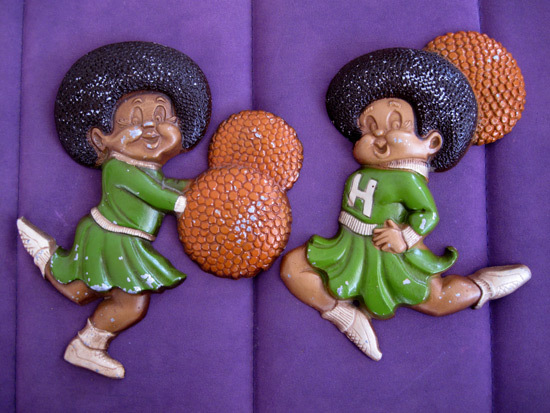 Whenever I look at these metal cheerleader wall plaques made by Sexton in the 1960′s I think of Toni Basil because you can see how happy these girls are doing their cheers. In 1982, the year that “Oh Mickey you’re so fine, you’re so fine you blow my mind, hey Mickey” was all you could hear on the radio, Toni, singer, choreographer extraordinaire and the woman responsible for making cheerleading ultra cool, and I were best of friends. She was one of my first girlfriends when I moved to LA in 1976 and I’ve always loved my collaborations with her because she’s fearless, decisive and eternally ahead of the curve. 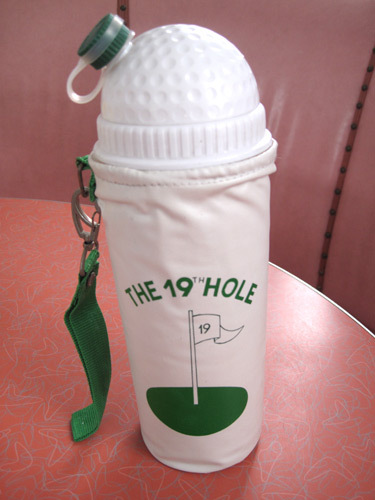 I’m not much of a golf buff but I love kitschy golf accessories, especially those designed around my favorite hole, the 19th. 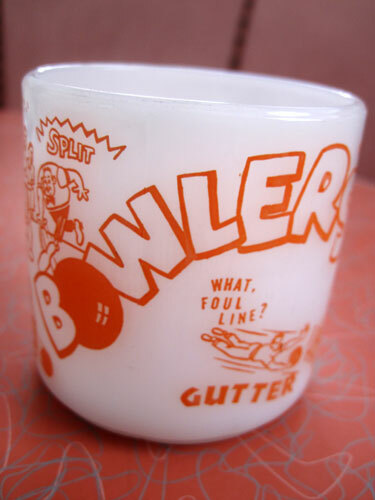 Although I’m sure that the golf ball dome lid gets screwed off of this 10″ high plastic refreshment vessel long before the green is spotted on the long-awaited hole. 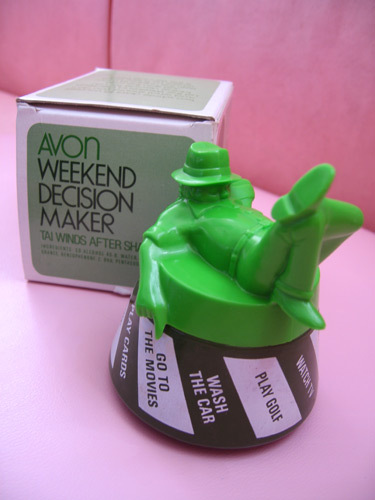 Which is good because the glamorous leatherette cover is so cheap and bunchy on the bottom it tips to the left like the leaning Tower of Pisa so the contents would be watering the green instead of your gullet by the time you reach 19. Happy Masters! Ponytail was one of the first if not THE first ubiquitous teenage girl brands. 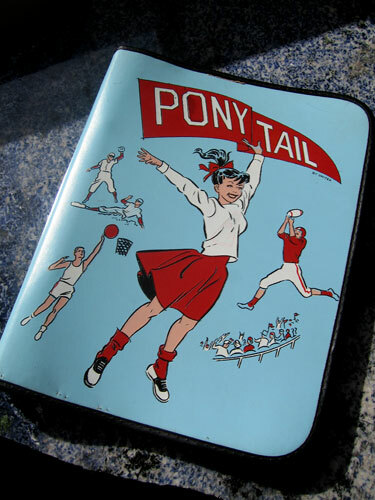 In the age of Elvis Presley, when such creatures felt freedom unlike any generations previous, Ponytail couldn’t crank out matching products fast enough – eyeglass cases, wallets, diaries, treasure boxes, 45s record cases, Deskette desk sets - all in the signature Ponytail baby blue or powder pink leatherette.